This is a much larger section because of so many surviving records. Lengthy lists and other details on this page are often provided in downloadable PDFs. Church Records (mainly 19th century) are detailed separately on the next page (see left hand column). See also many 19th century records listed in Byers graves in Co. Down. 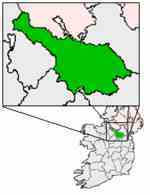 Co. Cavan in the context of Ireland. Andrew McKenzie (1780-1839), known as the “Bard of Dunover”, was a rhyming weaver poet from Dunover, near Ballywalter in Co.Down. He also wrote under the pen-name of Philip McClabber. In 1810 his Poems and Songs on Different Subjects was published in an edition printed by Alexander Mackay, News-Letter Office, Belfast. The volume’s preface is dated October 1810. 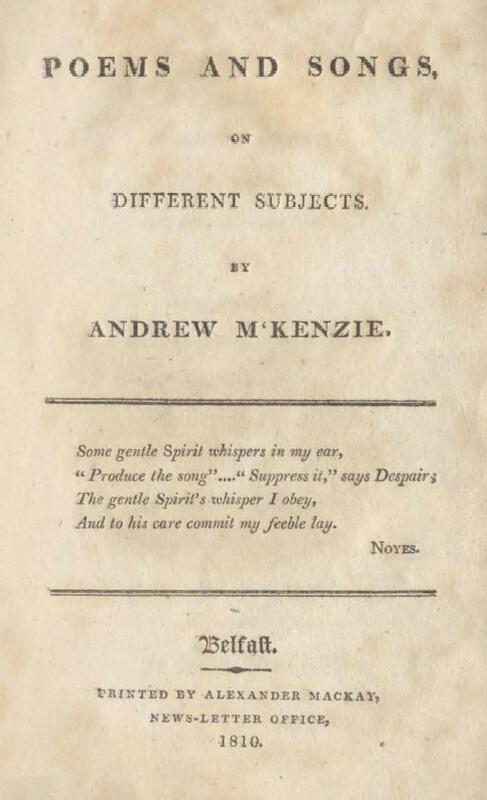 Above: Title page of McKenzie's collection which is available to read online through the University of Ulster's Ulster Poetry Project. Top right: McKenzie's portrait from the collection. It’s said that the 1810 collection earned McKenzie £200 which he used to buy a house and a fishing boat. Sadly the boat was lost and he had to return to his daily labours to keep his wife and his “six naked children”. And tuneful nature breathed from every wire. He lived unaided and neglected died. The Linenhall Library in Belfast has a card index file which contains an alphabetical listing of Birth, Death and Marriage insertions in the Belfast News-Letter from 1801 to 1863. The following PDF provides a transcription of all the insertions relating to Byars and Byers in that index. It should be possible to identify those newspaper insertions through the online British Library collection of newspapers 1800-1900. When this BL collection is searched for Byers it produces 90 such entries, though only 17 of those 90 refer to the period listed by the Linen Hall Library index which has 25 for the same period. A copy of much of the 1821 Co. Cavan census was found in the 1950s in Cavan town - sadly Killinkere was not amongst the surviving records. A microfilm copy is in the Cavan County Library and this was consulted for the following PDF listing of persons named Byers. A double-checking of these facts was carried out by referring to the LDS microfilm copies of the census (numbers given below). The 1821 Census has since become available online, thanks to Debbie Annandale. The order of reporting in the census meant that, in most cases, sons were listed first, then the daughters. My reporting of this information (see PDF below) replaces that original ordering with a chronological one. Many BYERS families and individuals are listed. Robert Byers, residing at Tievanaman [Tievenaman] in the parish of Killinkere and Barony of Castleraghan, possessed 2 guns and 1 sword. He had no pistols, blunderbusses or bayonets. The 1823 Tithe Applotment Act allowed a tithe or tax to be paid in money instead of in goods. It was calculated on an estimate of what the land could produce, based on an average of the seven years up to 1 November 1821. The Tithe Applotment books cover 1823 to 1837. For each townland in a given parish they provide the names of the occupiers, the acreage and quality of their holdings, the valuation of the land and the amount of tithe to be paid. Apart from Killinkere (see below), I’ve still to check the actual Tithe Applotments in PRONI and, likewise, the Townland Valuation of 1828-40, which was primarily a valuation of land but included houses, initially those with an annual value of £3 or more. From 1838 this was increased to £5. What a pity that some of the townland records for Killinkere Parish are missing, viz. Lissanymore, Gallon, Corratinner, Beagh Glebe, Togher, Termon, Derryhum, Carrickeeshill and Greaghnacunnia. The following are the townlands which include Byers occupiers. A list and map of the Killinkere townlands (49 according to the 1851 census) can be found on the Maps page. The National Library of Ireland holds the papers from the Farnham estate and a complete listing has been made available online. The PDF below is a listing of the specific Byers references and is helpful in pinpointing particular groupings of families. The actual documents (which I've not yet seen) may shed further light on those individuals. 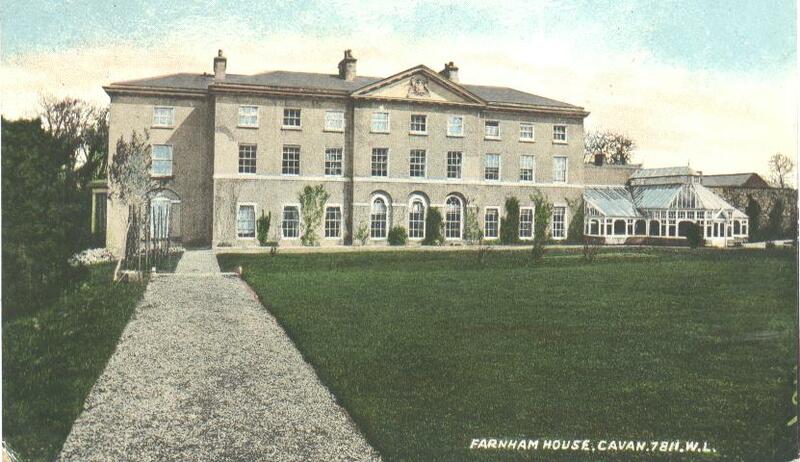 Pic of Farnham House, built c.1810 and designed by Francis Johnston. The first full-scale valuation of property in Ireland was the Primary Valuation undertaken by Sir Richard Griffith and published between 1848 and 1864. His Valuation records every landowner and householder in Ireland in a period shortly after the famine. The main difference between the Tithe Applotment Books and Griffith’s Valuation is that all householders were listed in Griffith’s. Remember that the types of acres used in each, the Irish and English acre, are different. This will account for difference in size of land held by a family from one valuation to the other if they appear in both. Remember also the fact that houses of less than £3 annual value were included up to the year 1831 and excluded from that point forward; and those with an annual value of £5 were included up to 1836 and excluded from then on. For Griffith’s Valuation, the number after G indicates the number of householders with that name in a parish or barony. For the Tithe Applotment Books, T indicates that that name occurs at least once in the parish in question. Cavan and Down are the two Ulster counties with the greatest number of Byers families. Below is the typical information given for two Killinkere townlands with Byers families. Thursday, James Byers and his wife, Mary Steel, were executed in Glasgow, for the murder and robbery of James Martin [an elderly uncle], in March last. It will be remembered that these criminals were found guilty of administering a large quantity of laudanum to the deceased, mixed with his liquor, in a spirit-cellar in High-Street [Glasgow]. Since the condemnation of the prisoners, the female made a full confession of her guilt, but her husband denied all knowledge of the transaction. Both Byers and his wife belonged to Belfast, and had been married about five years. The female acknowledged having robbed Martin in the house in which they lodged, during which time her husband held the candle, and that he afterwards got a share of the booty. The woman, who was a Catholic, was very attentive to the instructions of the religious gentleman who attended her, but her husband, who was a Protestant, was callous and insensible. At eight in the morning the Magistrates entered the hall, and the prisoners were brought up. Nothing could exceed the calm firmness of the female, who was an extremely good looking woman, and was neatly dressed. After partaking of a glass of wine each, they were conducted to the scaffold by their friends, where Byers made a confession of his guilt, and that he had received some of the money. It is said that the whole plan of the murder and robbery was devised by his wife’s mother. Byers, since the condemnation, had no desire to see his wife, and their behaviour to each other on the scaffold strongly countenanced this – there, if they did notice each at all, the recognition was very slight. When the preparations had been completed the signal was given and the drop fell. After hanging the usual time, the bodies were carried to the College for dissection. According to a Glasgow University PhD thesis by Karen Jane Merry, Murder by poison in Scotland during the nineteenth and early twentieth centuries (2010), James and Mary arrived in Glasgow from Belfast on 9 March 1831. With them was the elderly uncle, John Martin and James’s brother, Robert Byers. A shop assistant, John Lamont, gave evidence that Mary Byers had bought two pence worth of laudanum on Tuesday 10 March. 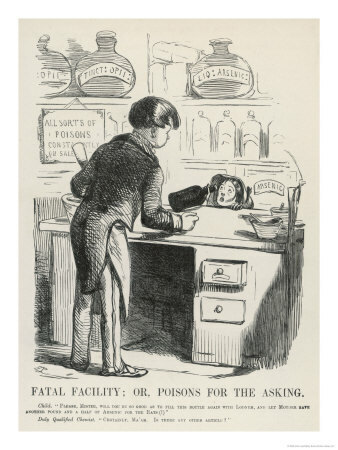 Alexander Milson gave evidence that Mary had also bought a further penny’s worth of laudanum from his brother’s chemist shop in Glasgow’s High Street. 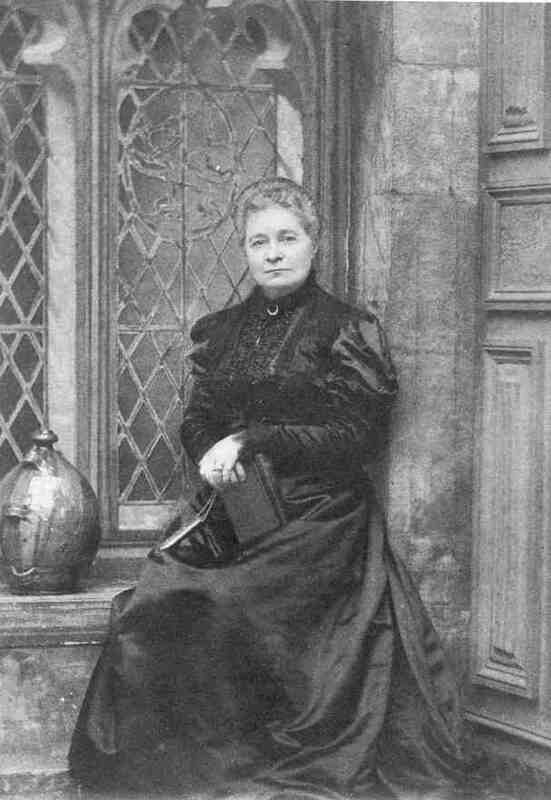 Margaret Byers (pictured below, c.1885) founded what became Victoria College, Belfast, in 1859 as the Ladies’ Collegiate. She became renowned as a pioneer of women’s education, a business woman, philanthropist and a suffragist. Brief biographies are online at the Dictionary of Ulster Biography and at Ulster History. There’s also a comprehensive book about her: Margaret Byers Pioneer of Women's Education and Founder of Victoria College Belfast, by Alison Jordan (QUB Institute of Irish Studies, no date). She was born Margaret Morrow, the fourth child and only daughter of Andrew Morrow, a farmer and flax mill owner in Rathfriland, Co. Down. Andrew Morrow’s wife, Margaret Herron was nearly 50 when her daughter was born. Andrew was a Presbyterian elder. He died when Margaret was eight years of age and she was sent to live with two uncles in Stoke-on-Trent. She returned to Co. Down to marry a Byers, the son of another farmer and flax merchant just 10 miles away in Co. Armagh. Rev. John Byers (1830-1853) had studied at Glasgow University (BA 1846, MA 1847) and then Princeton University, New Jersey, USA. The American Board of Missions commissioned him as a missionary to China. The couple married on 24 February 1852 at Clonduff Presbyterian Church (three miles outside Rathfriland heading towards Castlewellan) which had been built just 10 years earlier. They moved to Shangai where John became gravely ill. The family (there was now a baby boy called John) sailed back to New York round Cape Hope but Rev. John died just eight days before landfall. He is buried in Greenwood Cemetery, New York. Margaret and her son returned to Co. Down and her subsequent life has been well documented elsewhere. For the son, Sir John Byers, please see his listing under 20th century sources. These are the Rev. John Byers' antecedents. See more information at thePeerage website. Samuel Byers (dates unknown) lived at Mowhan House, Mowhan, Co. Armagh. His son Samuel Byers (1790 - 16 May 1864) married Susan Maclean (c.1797 - 19 May 1873) in 1817. They lived at Mowhan House, Mowhan, Co. Armagh. William Byers (1842 – 6 April 1927) married Sarah Fisher, then Isabella Mandale; Deputy Lieutenant and JP for Co. Armagh; High Sheriff of Co. Armagh in 1916. Lived at Mill Farm, Mowhan. A case of considerable interest came on for hearing this day before the presiding magistrate Mr. NIXON. James WILSON, an agent of the Messrs. Wallace, residing in Ballyduff, received orders from his employers to send his collections of finished work to BYERS to Virginia, that they might be forwarded thence to Glasgow. His last remittance was a bag (produced) containing about one hundred pieces, on each of which were imprinted two marks, the first an indelible one, affixed originally in Glasgow before the goods were forwarded to Ireland, and the second in plain ink, denoting the price paid by WILSON to the country girls for the execution of the needle-work. During the time that this bag was in Byers’s possession he had been very unexpectedly replaced by Petrie, an agent sent over from Glasgow, and commissioned to take up such work belonging to the firm as Byers had given out and paid for. This he accordingly proceeded to do, and received from Byers a considerable number of pieces amongst which he alleged were those in question. It appears also that the prices affixed to the pieces by Wilson in each case had been erased, and a higher amount substituted, which amount Petrie swore Byers received from him. The Plaintiff, Petrie, who was not represented by attorney, rested his case on the identity which he and the witness Wilson fully established between the pieces received by Byers and those paid for by himself. The defence set up by Mr. HARMAN was, that the delivery of the parcel to Byers had not been proved, and that the evidence adduced did not sustain the charge of false pretences. The magistrate, however, very properly overlooked the legal informalities of the case and bound over Wilson and Petrie in sums of £20 each to prosecute at the next quarter sessions. VIRGINIA PETTY SESSIONS – THURSDAY. Sub-constable J. B. BRADSHAW v. Robert BYERS for being drunk. Sub-constable Michael M’CORMACK v. Joseph BYERS, for same offence. Civil registration of all deaths began on 1 January 1864. They were published as indexes for each year by the General Register Office in Dublin. From the details given in the index it is possible to request an actual certified copy of the death certificate. Please note that the given ages (frequently in “round figures”) are often quite unreliable, whether through Pension subterfuge, vanity, ignorance or guesswork. Where the age was less than 1 year it was recorded as 0. These records were searched for all references to Byers and to Ney. The years 1864–1869 were also searched for any trace of a Joseph McIlwaine. This was Jane’s father (Jane married widower Robert Byers, my great grandfather, in 1872) and he was described as “The late Joseph …” in her marriage certificate. He was similarly described in Anne McIlwaine’s marriage certificate of 1866 – “The late Joe …”. Nothing was found – the presumption now being that he probably died pre-1864. The records revealed that my great grandfather, Robert Byers, died from diabetes on 30 November 1877 at his home in Rooskey. His death was registered “in the District of Cootehill in the Union of Cootehill in the Counties of Cavan and Monaghan”. His widow, Jane, remarried the following year. Civil registration of all non-Catholic marriages began in Ireland on 1 April 1845. They were published as indexes for each year by the General Register Office in Dublin. These indexes were hand-written up to, and including, 1863. From the details given in the index it is possible to request a copy of the marriage certificate. If the name of the other spouse is known, this too ought to be indexed and the references (Volume and Page numbers) should correspond. Widows remarrying have both names shown (here as “/ name”). The PDF below details the Wills and Probate details for those with the surname Byers. Some of those (for Belfast, Armagh and Londonderry) and some more recent ones can be accessed online through PRONI's website. 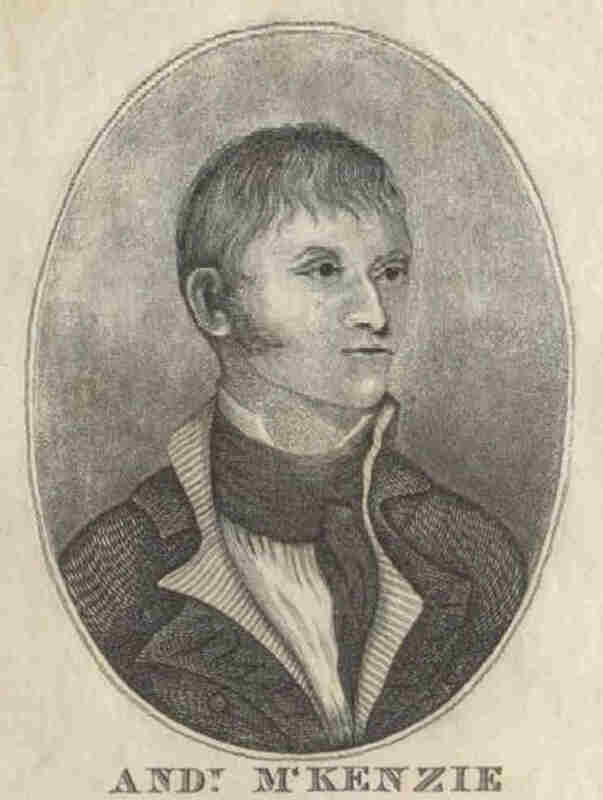 In 1834 Robert Byers, at the age of 24, left his home in Co. Cavan, with his wife Sarah (formerly Sarah Coote – and said to be from Cootehill) and their two-year old son, William. They settled in Cavan Township, Upper Canada, having purchased Lot 15, Concession 3, W.1/2 from John Brown in November 1834. 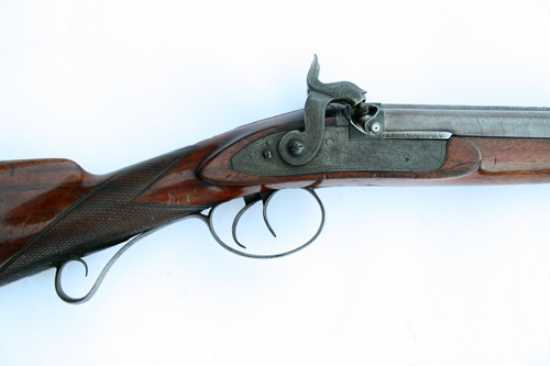 In February 1835, Robert Byers sold this back to John Brown and purchased from him Lot 19, Concession 3, N.E.1/4. The following PDF, much of it a literal transcription, is from the Magill family website. The 1821 Cavan Census lists a William Magill at House No.5 in Derrylahan, Crosserlough, and the Magill website identifies William's wife Susannah as a Byers. The suggestion is that Susannah was possibly related to the Byers family living at House No.12 (see Page 5 of the 1821 Census PDF) in the same townland. She may also be a relation of Joseph Byers, freeholder in 1825 at Derrylahan which was also tenanted by a Joseph Byers. This next PDF makes a start at identifying Byers family members who made the cross-Atlantic journey in the 19th century. 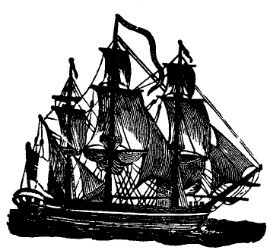 Others may be found at the invaluable website of the Immigrant Ships Transcribers' Guild. Woodcut of a 19th cent. 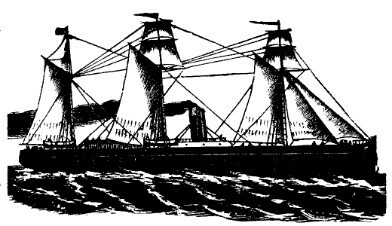 steamship.